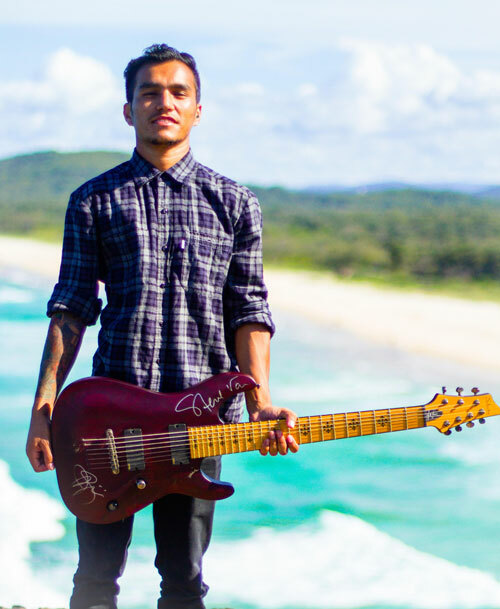 Suman Khatri started playing guitar when he was 14 at school mostly influenced by metal bands like lamb of god, slipknot, pantera, as I lay dying etc. He performed at school programmes which led him to join school band. He then formed a band named “idiosyncrasy” during college time and won few band competitions along with the title for “best composition” in 2008. He went to Australia in 2009 for further studies and continued his musician journey. He joined his first Australian metal band named “silent pride” where he gained his more musical experiences. He then continued to take private Skype lessons with few known metal guitarist from USA, Italy and U.K. He got lessons from Wes Hauch (the faceless), Jason Richardson (Born of Osiris), Ryan knight (The black Dahlia murder), Franceso filigoi (Abiogenesis). He then started giving private lessons over Australia to few students around Australia Asia and Europe via social media. Then he joined Gold Coast based Australian death metal bands named “4 dead in 5 seconds”. He toured Nepal with his band for silent festival in 2012 and few shows around the country. 4 dead in 5 seconds then flew to Europe in 2013 for recording their second EP named “bestiary – book of beasts” which had a great success after the release. He then started his new project named “Convergence” collaborating with one of this good friend Rupesh who lives in U.K. and released the single tilted “Translucent” in 2015. He flew back to Nepal in 2016 and decided to join Kathmandu Jazz Conservatory(KJC) for new change. He is doing some modern jazz at KJC. He is currently teaching here in a guitar faculty since 2017.